I actually drew this at the end of August for a friend's wedding anniversary card. It was in inspired by Joanne Fink's book Zenspirations Letters & Patterning as well as Penny Raile's chapter in The Art of Zentangle book. Seeing my frustration after spending a whole afternoon trying to shade it (using photocopies) my husband suggested that I don't shade my tangles or similar designs as he likes them with just the penwork - this is where Penny Raile's artwork comes in for I immediately showed him her work without shading in the book. My initial response was "NOT SHADE - that's for beginners, I can't not shade, but........ there's Joanne's colouring & Penny's tangles & ........... they're not beginners." So, I've been thinking quite a bit about the subject. I find that I can draw my tangles but when it comes to shading them - though I know the theory of it & where to shade - I can feel myself becoming tense, in fact it feels like a chore looming ahead. I can see that shading adds depth & dimension but I really dislike the gritty smudginess of graphite. I'd be interested to hear anyone else's thoughts on the matter. 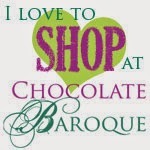 Stamps Chocolate Baroque UDLSP0310 Swirly Pets. Inks VersaFine Onyx Black (hearts). Pens/Markers 01 Uni Pin Drawing Pen, Memento Tuxedo Black Dual Marker (edging message panel). 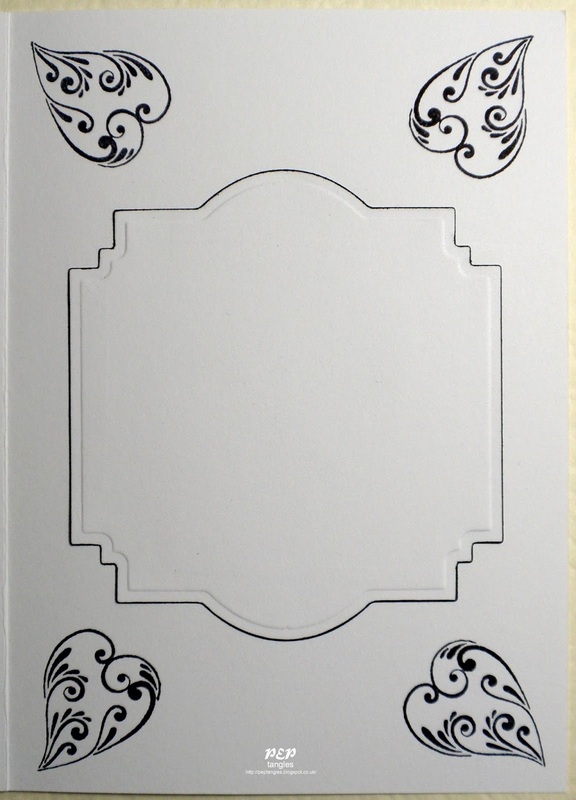 Cardstock White & Black from stash. Paper Winsor & Newton Cotman 190gsm Cold Pressed/NOT Grain Fin Watercolour Paper. 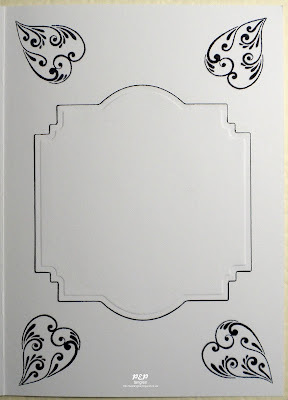 Die Spellbinders Nestabilities Labels Twenty-Two (message panel). 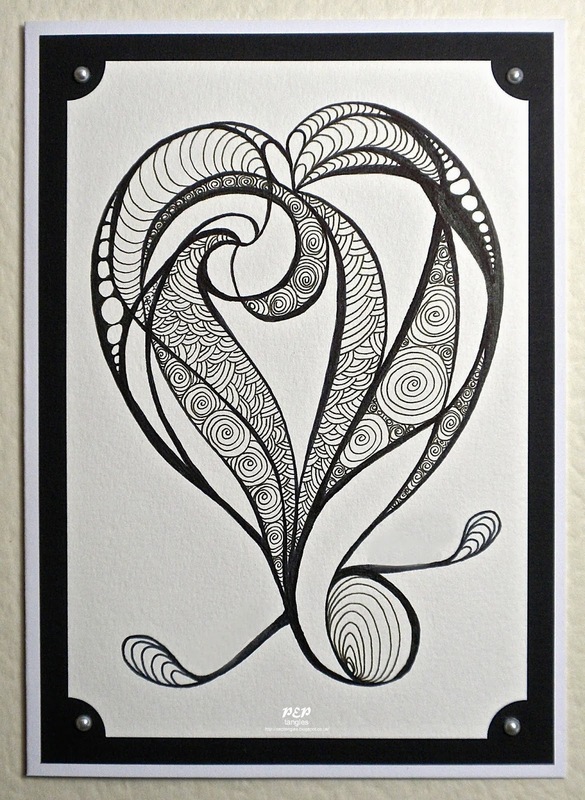 This is such a lovely and beautiful drawn heart Paula!It must have been so nice to give this to your friends and I am sure they loved it! I know very very little on this subject Paula (only the stuff I've learnt here on your blog) so I don't know whether shading is supposed to be a 'must' but I do prefer them in plain back and white. I think the pen work stands out more, but that's purely my opinion and my tastes. I do think Saint R has the right idea in that if shading make you tense, then don't do it. It's a hobby and something you should enjoy doing, not a chore to endure. So glad to hear you are feeling a bit better Paula. Your heart tangle is beautiful. I don't think you need worry about the shading, your combination of tangles gives a lot of depth to your creations. 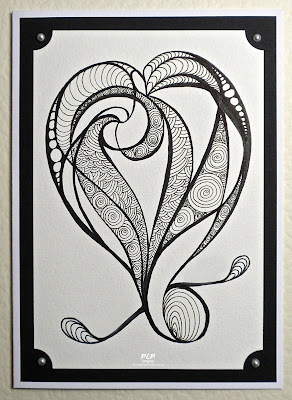 Wow Paula, this heart card is simply stunning and I m sure the recipients must have been delighted with it. You are so talented and I am so pleased that you are feeling a little better. Take care. A lovely design and very interesting to hear your views on shading which just about reflect my thinking as well. I'm pleased to hear I'm not the only one who doesn't really enjoy shading, nor the results in many cases! C & P still going on here, but wanted to check out your lovely artwork. I believe shading is a matter a choice too, so depending on the subject, I wont's always do it. Your hearts are gorgeous, and believe they are perfect just the way they are. Blessings, my friend! Hi Paula, so nice to see a post from you. This is a beautiful creation and works so well without shading. I would say go with how you feel, it is your style after all, be confident in what you do. If you like to use colour and don't get that negative feeling why not use that in your tangles, otherwise leave well alone. I am sure that you already know of her work but Helen at http://alittlelime.blogspot.com.au has some superb tangles that don't use shading, showing that works of art don't have to conform to set rules. as a Certified Zentangle Teacher, i feel like i am supposed to always shade, but i hate shading. i do like the depth it gives, but to me it's more of a pain than it is worth. (don't tell rick and maria i said that ;) ) when i'm so stressed over shading - i am missing out on the 'zen' portion of the tangling. to each his own, but i'm not going to worry over the shading for myself. what a beautiful card! i know your friends love it! Oh Wow! Paula this is absolutely stunning. The heart shape is perfect and I do like the clean monochrome colours! Beautiful work! This is a beautiful card. Don't be afraid of shading. You can practice ... scan your card and practice shading on the printed copy. Check out the book Made in the Shade by Chris Stravolis Letourneau, CZT. It's filled with helpful shading techniques. Your card is very beautiful and I'm sorry I cannot offer you more feedback on the shading.